Zie hieronder voor meer info. Dit is Elena, onze rots in de branding. Liefde op het eerste gezicht. Sinds 2005 heeft ze ons al naar vele mooie plekjes gebracht: de Kanaaleilanden, Noorwegen, de Scilly Isles, Denemarken/Zweden en nu rond de wereld. Wij vinden haar de mooiste, stoerste, snelste en knapste boot die we kennen. Elena is een Veliger 477 uit 1996. De aluminium romp, getekend door een beroemde Russische jachtarchitect, is gebouwd in de Oekraïne. Dit is romp nr 4 uit een serie van 10 schepen van hetzelfde type. Ze is in Nederland afgebouwd en door ons geheel gerefit. Elena's maten: 14,50m x 4,65m x 2,40m. Elena is compleet uitgerust en klaar om te vertrekken voor haar volgende grote reis (na onze terugkomst in juli 2012). 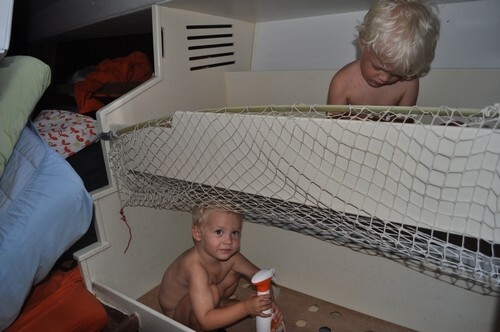 Elena is een heerlijk schip om mee te reizen. Op zee enorm comfortabel en snel. De Atlantische oceaan staken wij over van Gran Canaria naar St. Lucia in 16 dagen. De Pacific van Galapagos naar de Markiezen in 17 dagen met een record dagafstand van 219 mijl. Dat is enorm snel, helemaal als je bedenkt, dat we op die laatste oversteek geen extra bemanning hadden. Door haar lengte en gewicht is ze een uiterst stabiel en dus comfortabel schip op zee. Ondanks haar lengte is ze toch goed te zeilen door 2 mensen. Alle lijnen worden teruggeleid naar de kuip, dus ook om te reven hoef je nooit naar voren. Voor anker is het heerlijk dat ze zo'n grote kuip heeft. Het zwemplatform maakt in en uit het water komen, maar ook opstappen vanaf de steiger heel makkelijk. We voelen ons ook altijd veilig op de Elena. Het is een prettig idee dat ze van aluminium is en in zwaar weer maken we ons ook nooit zorgen. In onze zoektocht naar de geschiedenis van Elena vonden wij uiteindelijk Myroshni, een designer die aan Elena gewerkt heeft. Hieronder een mailcorrespondentie met de Chief Designer. Veliger 477 was built in Nikolaev in 1996 on Navigal yachtbuilding yard. The hull designer is Oleg Larionov from Saint Petersburg, Russia, and the original name of project is Mobile 477. Veliger is the fourth hull. The first one was built for marine academy in Tallinn, Estonia, and as I know, is in operation till now. The second boat named San Benedetto was built for banker from Nikolaev. 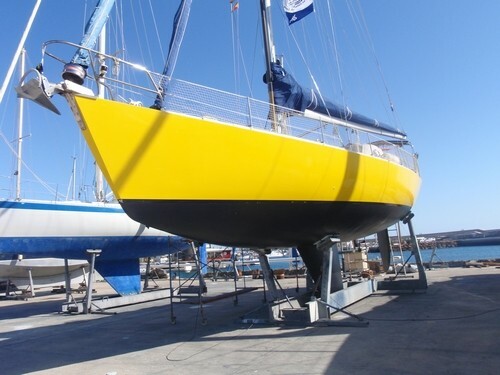 Now the new owner ordered the full reconstruction of the boat on Navigal shipyard. Then, after serious changes, the project received the name Navigal 1445. Veliger was built by this project. The project was made by design group ALA. I worked there as chief designer, and developed the general arrangement of the yacht. 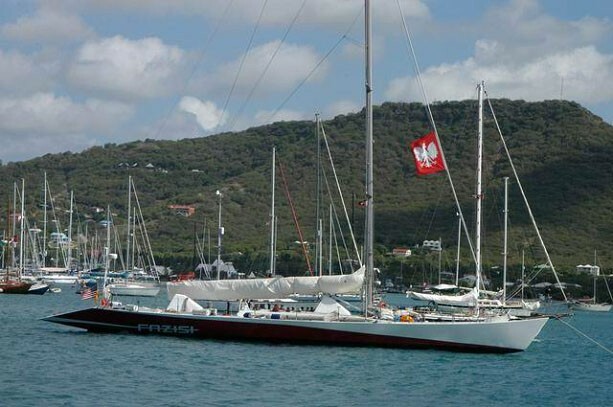 The project Mobile is very interesting because it was a prototype for yacht Fazisi, which participated in Whitbread round the world race 1989/90 under the flag of Soviet Union, the country which does not exist any more. It was a crazy and dramatic project. 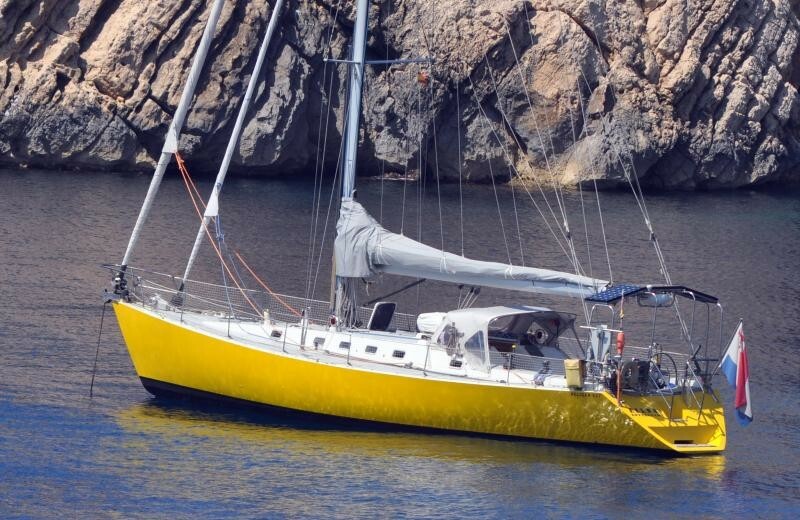 Fazisi was 11th from 23 yachts, which result was very good for the first attempt, taking into consideration the inexperienced crew and poor budget. All main ideas and structural decisions of Fazisi were worked through on Mobile. That is why Mobile has such unusual shape of deck (Fazisi was called Bananaboat). When reworking the project we removed the banana shape of deck (as it was possible), and fundamentally changed the general arrangement of inner spaces according to owners wishes (sometimes rather eccentric). 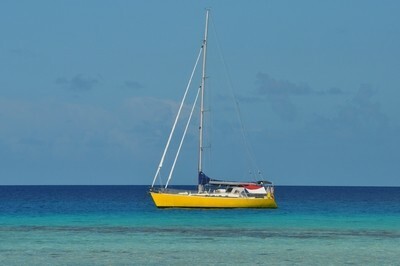 Veliger was launched in summer 1996 and delivered to the owner on July, 12. 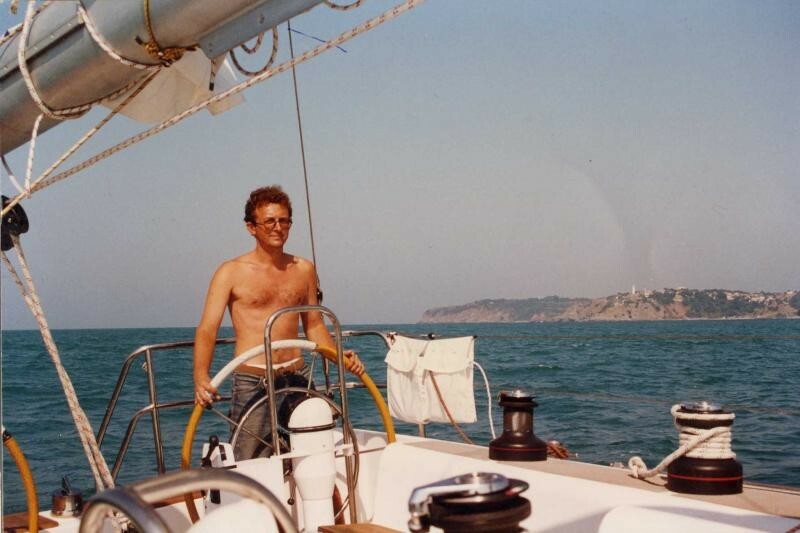 On the position of chief mate I took part in first trip of the yacht – from Nikolaev to Portofino cape in Italy (about 1750 nm). The weather was fine on the entire route. That is why I don’t know how she behaves under stormy sea conditions. But generally I have a good impression. Near Bosporus we reached 12.5 knots speed going downwind, and in Mediterranian, in Dora strait – 15 knots (usually there is a strong wind there). 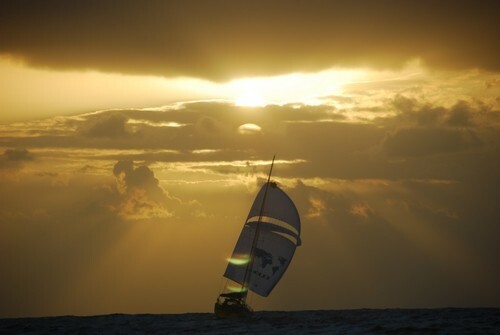 Then, the crew who sailed on Veliger around the Europe told me that during the storm in the Bay of Biscay the speed reached 17 knots, and the boat behaved well on the waves. 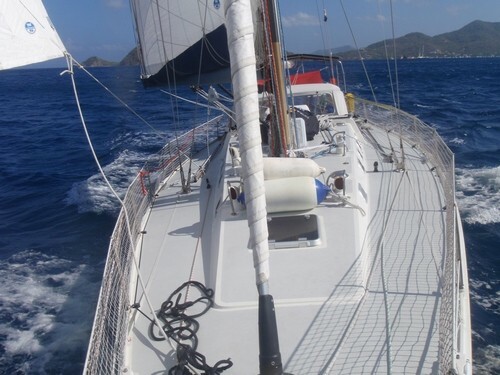 The yacht was well balanced, and under right regulation of sails we have no need to steer for hours. Now I see on your photographs that she got a new mast now. The hull of Veliger is safe, and assembled with good quality. Hull material – aluminium-magnesium alloy AMg1561 was used in Soviet Union for battle ships construction (as well as now in Russia and Ukraine). 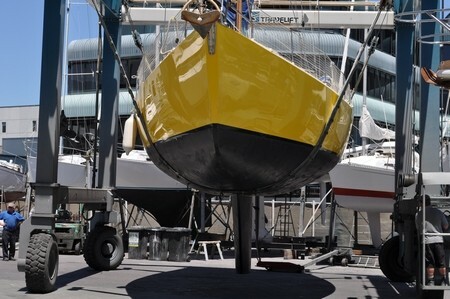 The rudders on first and second yacht were made of GRP plastic on the rudder stock of stainless steel. The owner of Veliger was not sure in the quality of plastic rudders, that is why he ordered the rudder fully made from stainless steel. As I remember, the rudder stock and hull constructions for rudder fastening were rather strong, as well as rudder itself. 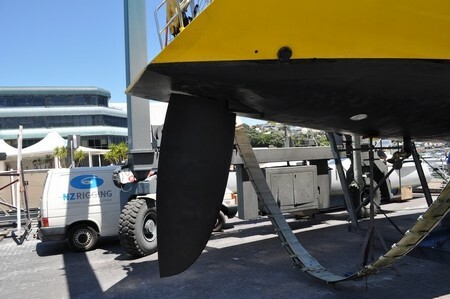 Their could appear problems with galvanic corrosion, but it is always possible to install additional anodes in the area of rudder and propeller. According to owners decision, we first time installed on Veliger the hydraulic steering (previous boats had traditional steering ropes). I’m not sure that this is very comfortable, because we had to rotate steering wheel too much. But it is possible to install bigger hydraulic pump in order to reduce the number of rotations, which is very important especially when steering on waves. Many things are forgotten (My God! 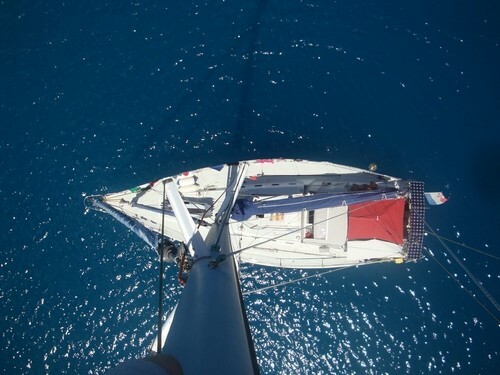 More than ten years passed, the time is flying too quickly), but I remember the main thing – we had a good opinion about yacht, and we felt surely onboard. Now, before such serious travel, you need to make a very thorough inspection, especially if you will take children onboard. About original drawings – possibly I have something, I’ll check the files, but I’m not sure after so many years. It is better to ask the builder (Navigal yard), possibly they will help (if they’ll want!). 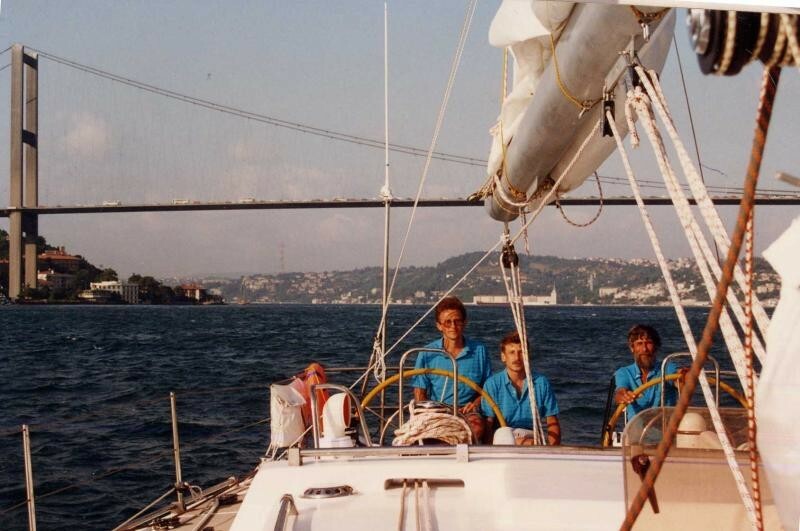 I’m sending you some photos: two of them – out first cruise under sails, one – our crew under the bridge Europe-Asia (Istanbul), the next one – my person (slim yet) in the mouth of Bosporus. Then – some photos of Fazisi.